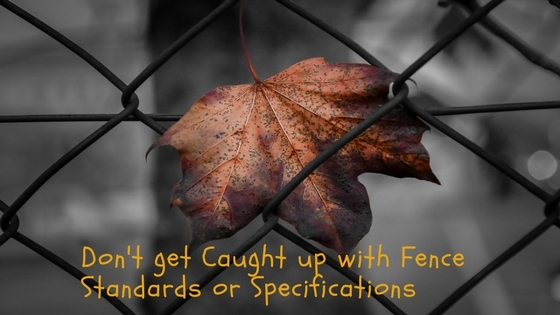 Stumped by a Fence Standard or Specification Reference? Wheatland’s Fence SpecCheck is a compilation of all related fence standards and specifications. Fence SpecCheck not only lists the standards and specifications but provides a summary of the standard which may provide the answer to your question. Throughout the year, Wheatland monitors all standards and specifications to ensure Fence SpecCheck is up to date. ASTM is the primary source of fence specifications and standards in the United States and many parts of the world. It is safe to say that just about all fence standards, guides and specifications either reference or are derived from ASTM. Currently, there are 49 ASTM fence related standards of which 43 were developed by the ASTM F14 Fence Committee. All the agencies or associations listed above reference some or most of the ASTM fence standards within their standards or material specifications or describe specific products using ASTM specifications. In some cases, when a specific ASTM standard is not referenced by an agency, they specify the manufactures product specification that complies with ASTM standards. The key is to know ASTM standards and to have them available for quick reference which can be done in several ways. First, by purchasing from ASTM (www.astm.org) a 12-month subscription of ASTM Volume 01.06 Coated Steel Products. The volume contains over 80 standards including all fence related standards. The best bet is obtaining Volume 01.06 on line version in that standards that are revised during the year are updated and posted immediately whereas the published version only comes out once a year. Second, every few years ASTM publishes a condensed version ASTM fence book containing the 49 fence standards at less cost which is also offered through AFA. Finally, one can join ASTM, become a member of the F14 Fence Committee and as a member receive the on-line version of Volume 01.06 free. Yes free! Now that you know where to obtain all the ASTM standards where can on find the others? The Federal Specification RR-F-191 series, and FAA specifications are posted on line. AASHTO M181-10 can be purchased on line here. Do you still have questions about a Fence Spec or another fence question? Feel free to reach out to us anytime at fence@wheatland.com and we will provide the necessary assistance for our fencing needs. Download the Fence SpecCheck Today!